Annie's House is a guest house set in Adderley Street. It enjoys proximity to the town whilst retaining the quiet of a country lane. The guest House is both authentically Victorian and comfortably Modern, with spacious light-filled rooms equipped with every possible comfort. 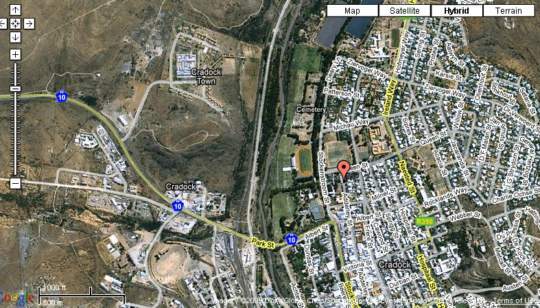 A warm welcome, friendly assistance and information about Cradock and its environs awaits you. For your convenience, we are fluent in English and Afrikaans. All prices quoted, includes breakfast. Dinner can also be provide at R150.00 per person. Double Room with a queen size bed, tea and coffee making facilities, en suite bathroom with a bath & shower. Double bed, TV/M-Net, tea/coffee making facilities, shower, clock/radio, non-smoking, fully serviced. 1 Double bed, TV with guest house DSTV, clock/radio, shower, non-smoking, tea/coffee making facilities, fully serviced. 1 Double bed, TV with guest house DSTV, tea/coffee making facilities, clock/radio, shower, non-smoking, fully serviced. Double bed, TV/M-net, tea/coffee making facilities, air conditioning, bath, clock/radio, non-smoking, fully serviced. 2 single beds, TV/M-net, tea/coffee making facilities, shower, clock/radio, non-smoking, fully serviced. 1 Double bed and sleeper couch, bath and shower, tea/coffee making facilities, fully equipped, non-smoking, fully serviced. R120.00 extra per every one person more than two people sharing this room. 1 Queen size double bed with extra length, TV with guest house DSTV, clock/radio, non-smoking, shower, tea/coffee making facilities, fully serviced.